“I had missed out on the first cold spell in December and was beginning to worry that I might not get a route in before New Year. But, as luck would have it, I was to be in Achiltibuie over Christmas and New Year and John was to be in Aultbea for a week or so from December 28 and the Weather Gods looked favourable. 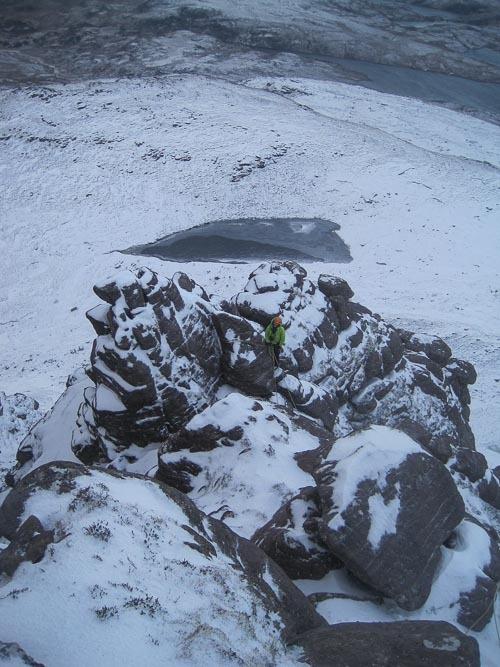 We hatched a plan to go in and look at the Pinnacle Ridge on Cul Mor on December 29. But the forecast turned out windy and cloudy, and the roads were icy, so we succumbed to temptation. The temptress being a short approach. So, a civilised start time, and we walked around the back of Stac Pollaidh in a big wind and spindrift to check out the buttress that lies to the left (looking up) of the gully that drops north from the summit. We started up a turfy chimney/gully from the very toe of the buttress, up a short corner to the crest, which then turned inhospitable and completely snowless and slabby (unjustifiable in crampons). Fortunately, a snowy ledge led rightwards from the base of the corner back to buttress base, but now a bit further up the gully! A slabby pitch from there led leftward to a very fine knife-edge crest and a belay below an obvious steepening. This went with a stiff pull or two on good hooks and turf and then to the top of a hidden tower. Fearing an abseil, a ledge system lead round the back and on to a final pitch to the summit ridge – from where we were nearly blown back down to the sacs. The result was Sionascaig Buttress (IV,5). Cul Mor was still on my mind and fortunately John needed no persuasion to stay on at Aultbea for a couple of extra days where I joined him last Saturday night. Dawn on Sunday [January 7] saw us walking in via the low approach on a fantastic morning – everything from the Fannichs to Quinag turning orange and pink as the sun rose. We eventually started our ascent on the farther west bit of buttress and climbed long three pitches up short walls, easy snow and turf and some steep, technical moves in a chimney system to end atop the tower that is the culmination of the lower rounded buttress below Bod a Mhioltait. Another abseil avoided by a descent down a gully on the west and short re-ascent saw us in the col below that pinnacle. A long easy pitch to above it and then an exit pitch through a straightforward chimney system saw us on the easy upper ridge. In the end, we figured we had had the rope on for c.350 m of climbing and there was further 50 or so to the summit of Sron Garbh. Though very escapable along its east side as per summer, the ridge provided a grand day out (and a torch lit return to the car) at a rating of III,4. This entry was posted in New Routes and tagged Cul Mor, Iain Young, John Higham, Stac Pollaidh. Bookmark the permalink. Pretty sure Sionascaig Buttress is the same as Pollaidhstyrene SMCJ 2006.